It’s ‘Movember’ again and men across Britain will be already be beginning to cultivate a new moustache to show their support for research into testicular cancer. The ‘Movember’ website is awash with advice for virgin ‘tache growers for many of whom this might be their first foray into facial hair. Backed by several high-profile celebrity supporters ‘Movember’ – and indeed facial hair in general – has been much in the news of late. 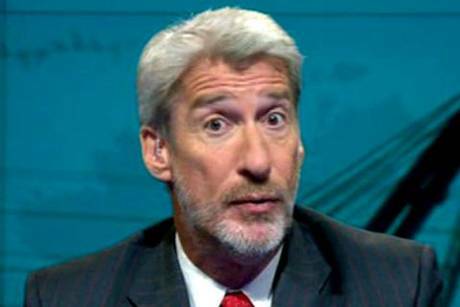 When Jeremy Paxman notoriously grew his beard it made headlines. When several Hollywood stars turned up at the BAFTAS sporting various types of facial topiary, eyebrows were raised and more headlines written. Things like ‘Movember’ give men who might not otherwise be bothered a free pass to try it out for a month, without the denigration of society! Throughout history men’s facial hair has come in and out of fashion. Indeed, it is quite interesting to trace different historical periods by the types of beards or moustache being worn. In many cases they have become archetypal – almost synonymous. 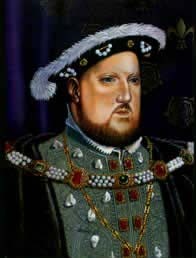 Henry VIII’s without his ‘spade beard’ is unthinkable, and a look through Holbein’s paintings of the period confirms a healthy belief in facial-hirsuiteness, at least amongst elites. By the seventeenth century the small, pointy, Van Dyke beard was de rigeur, sported by Charles I and the archetypal Cavalier look. The eighteenth-century was clean shaven as ideals of masculinity shifted towards elegance, neatness of appearance and refinement. More than this, a beard with a powdered wig is simply not a good look. In 19th-century Britain the ‘Beard Movement’ of men like Darwin brought it back with a vengeance, and enormous ‘badger beards’ became the vogue as men came to imitate the rugged masculinity of explorers, while at the same time viewing the beard as the ultimate symbol of male authority. In World War 1 it was pointy moustaches. The Second World War? Well, we all know what that did for the moustache! 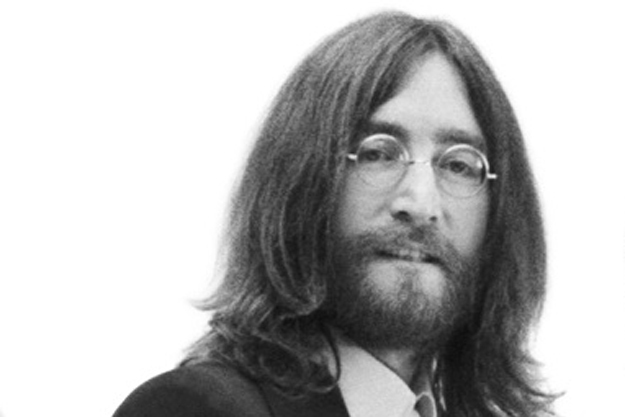 But even recently, the end of the sixties and hippy beards for example, facial hair remains an important cultural symbol. In the early modern, facial hair was seen as a result of heat arising from testicles. As such it was a visible symbol of male sexuality and ability to reproduce. In the 19th century, as attention focussed on both military conquest and the natural authority of men, the beard became a symbol of a man’s innate ability to rule. The bigger the beard (or in the case of the military, the moustache) the better the man. It was not without reason that some French military regiments placed their biggest moustachioed soldiers at the front of marching columns, since the enemy would hopefully see the approaching troops and quail, defeated before a shot was even fired! The British army also viewed the moustache as a vital accoutrement for the fighting man, so much so that troops were required by army law not to shave their moustaches, a standing order that wasn’t repealed until 1916. The wearing of beards or facial hair is most often a self-conscious decision. Whether due to fashion, military requirement or whatever, the assumption is that a man has a choice. But what of men who could not physically grow a beard or moustache? Some men, for example, are simply not capable of growing full beards. For such men things could sometimes be difficult. The growth of stubble was (and in some ways remains) a powerful symbol of the transition from ‘beardless boy’ to man – almost a rite of passage. In the seventeenth century, if a man couldn’t grow facial hair, he was viewed at best as juvenile and, at worst, as potentially effeminate. Through time, then, a lack of facial hair has caused interesting problems, but also some innovative solutions. The easiest and most obvious solution for the beardless was simply to disguise the fact. This could be achieved in a number of ways. First, and most simply, a piece of burnt cork was sometimes used by military recruits to disguise their lack of beard. Whilst perhaps mildly convincing from a distance, however, it could hardly stand for a real beard. 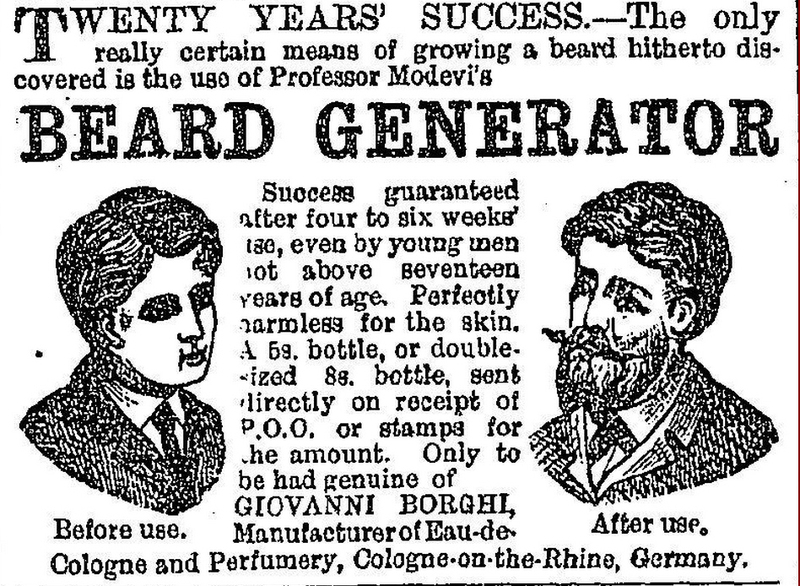 By far the most preferable alternative was to contrive a false beard using other materials, and it was this that some innovative makers sought to do. One popular method amongst the military was to use animal hair to fashion beards and moustaches realistic enough to pass muster at close quarters although there is not much evidence to show either how effective, how convincing or how comfortable they were. It was clearly enough of a problem, and there was sufficient demand, for entrepreneurs to begin to address the situation. In 1865, Henry Rushton of Clerkenwell applied to the British Library for a patent for his new “APPLICATION OF A CERTAIN KIND OF GOAT’S HAIR IN IMITATION OF HUMAN HAIR TO THE MANUFACTURE OF HEAD DRESSES, MOUSTACHES, AND ALL KINDS OF FALSE HAIR, AND THE PROCESSES OF PREPARING THE SAME”. 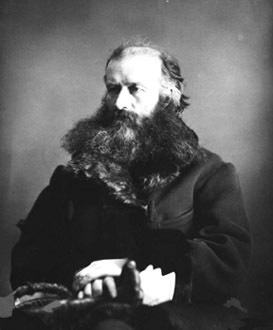 Rushton proposed to use a set of chemical processes to prepare mohair for various uses which “I apply in imitation of human hair for covering the foundations and forming plain ‘back’ or ‘Brighton Bows’ or any other plain hair head dresses, and apply the same also in manufacture of various kinds of false hair, such as ringlets, coronets, head dresses, whiskers, moustaches, and the like.” Whilst both men and women were the subject of his patent, it is clear that moustaches (or lack of them) were sufficiently problematic to attract his attention. Victorian quacks were quick to get in on the act too. This advertisement was typical of ‘remedies’ that sought to rescue the beardless gentleman from a potentially embarrassing situation. So popular were beards by the late 19th century, that even women wanted a piece of the action. In the London newspaper The Examiner in 1863 was a report from a French journal that stated “the new fashion for European ladies next winter will be the enlarging of their love-locks, and pulling them down over the cheeks in imitation of whiskers”. 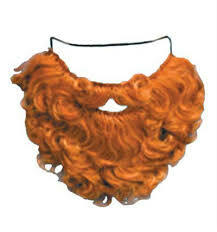 Whilst false beards for women were clearly a step too far, there was a way for them to imitate the new vogue. It is worth remembering that facial hair was, and still is, an extremely powerful and culturally-loaded entity. The practice of growing it, the act of removing it, and even the need to replicate or imitate it are all suggestive of the place of the beard within ever changing views of masculinity. For such a prosaic, everyday thing as the beard, it helps us trace a path through history about the ways men have understood, articulated and shaped themselves.